The Tektronix 4662 is an interactive digital plotter that cost $3,995 back in 1977. It uses a pen that is moved via precision stepper motors and fine steel cables, and it has an electrostatic pad that holds the paper down. The paper size could be set by moving the pen to a position and pressing down SET LOWER LEFT or SET UPPER RIGHT until you hear a beep once. Pressing down the CALL button until you hear a beep twice causes the printer to draw a self-test picture. The joystick allows the pen to be moved around wherever you wanted. 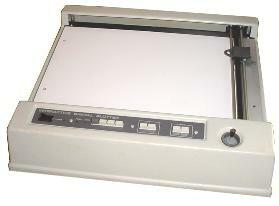 This plotter communicates with a computer, especially the 4050-series graphics systems via a GPIB (General Purpose Interface Bus) connection. Inside the plotter is an embedded 6800 computer system that provides unique capabilities for the plotter such as built in character fonts in memory. The computer only had to send simple ASCII information to the plotter and off it goes.